Bethany organized a mock trial in the spring of 2018. There’s a new team on campus! Bethany’s first-ever mock trial team is about to make history by competing at the America Mock Trial Association (AMTA) regional meet in Wheaton, Illinois, on February 8-10, 2019. Bethany Professor of Legal Studies Sara Edwards is one of the team’s three coaches. She explained the history behind the launch of Bethany’s newest competitive team. Bethany’s other coaches include alumnus Paul Gunderson (’07) who is the Assistant County Attorney in Brown County (Minnesota), and Ryan Drea, an Assistant Public Defender for Blue Earth County (Minnesota). The AMTA was founded in 1985 by Richard Calkins who was then the Dean of Drake Law School. 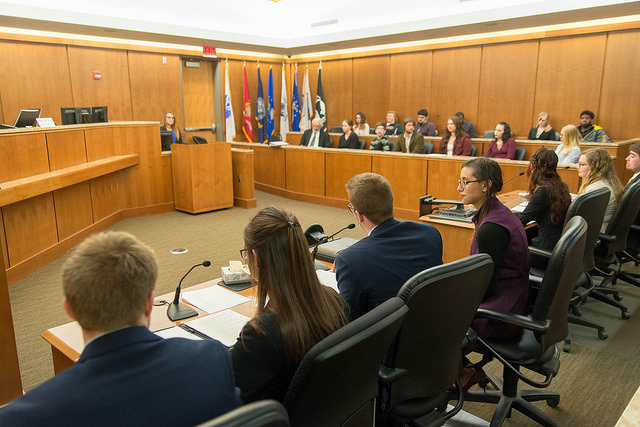 The AMTA serves as the governing body for intercollegiate mock trial competition, and sponsors regional and national-level competitions, as well as providing interesting and complex case materials for academic use. Currently, ten students are participating on Bethany’s mock trial team. They train for tournaments in Bethany’s Honsey Hall by preparing opening and closing statements, direct exams questions, cross examination questions, and any trial exhibits they might need to use. Madison Barber, a senior legal studies student at Bethany and member of the mock trial team, explained her connection. The preparation for mock trial competition can be both intense and a significant time commitment. Barber continued, “We started practicing in November for the upcoming mock trial event in Wheaton, Illinois. From there, we would practice every Sunday for two hours. The closer we have gotten to the tournament the more frequently we have met. Approximately 700 teams from over 400 universities and colleges compete in AMTA-sponsored tournaments each year. In total, AMTA provides a forum for over 5,300 undergraduate students to engage in intercollegiate mock trial competitions across the country. The top teams from each regional tournament advance to compete nationally. While the top teams are vying for championships, individual awards are also given to the top attorneys and top witnesses at each tournament, based on their performance. But the end goal of the mock trial participation is more about preparing for the future than winning accolades at the competition, explained Barber. Edwards shared similar sentiments about the goal for Bethany’s team.